Clay pot cooking is one of the oldest methods of food preparation, dating back to Roman times. The Romans knew that by soaking clay pots before cooking in them, you create a moist cooking environment that results in a most moist and tender food with a wonderfully robust flavor with a minimum amount of effort. Since the clay pot was soaked prior to cooking, during the cooking process, the walls of the pot help to diffuse the heat from the oven and as it warms, it releases the water in the clay as steam. 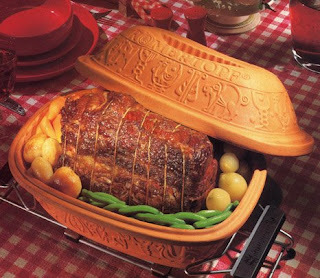 The most famous clay pot cooker is the Römertopf (literally meaning “Roman pot”) from Germany. Since it was first introduced in 1967, it has influenced the way people cook. With today’s emphasis on healthful eating, the Römertopf clay pot is perfect since there’s no need to add any cooking oils or fats to meat dishes since they will cook in their own juices. Food is thoroughly cooked and retains its natural flavors, nutrients and vitamins. Additionally, clay is a natural product and perfectly safe to use. One pot can do it all…. roast meat… make casseroles… bake vegetables… bake bread…. a truly versatile pot…. 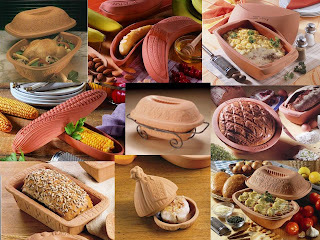 and if you prefer Römertopf has a complete line of clay cookware that comes in all sizes, shapes and types… there are various sizes of the basic Römertopf pot and also Garlic Bakers, Bread Bakers, Vegetable Bakers… not to mention the really unique Banana Baker and Corn Baker…. and much more. To see a full line of Römertopf clay cookware… go to Römertopf online.